Ferrari would characterize the F12 tdf as “The ultimate expression of the concept of an extreme road car that is equally at home on the track.” This quote would go and describe what is essentially the epitome of ‘legal’ (if we could even use that) Ferraris. This isn’t just another special edition Ferrari. No, this is hark back to the original Ferrari 250 tdf that graced the streets of Maranello and the likes more than half a century ago. The current tdf packs an engine that is more than 3x the output of the original car... which is definitely no slouch either. As for the model... it’s DEFINITELY not a slouch as well. What sets this beyond the likes of Hotwheels Elite, AutoArt Signatures, Kyosho, Minichamps and such, are the meticulous attention to detail and refined craftsmanship, similar to that of the real car. This one is the long awaited Diecast version with opening doors. In specific, it’s a Nero Daytona tdf with the Tricolore stripe down the centre of the car, which if this isn’t amazing enough, it’s actually 1 of 24 made by BBR. Being a proper BBR, this model came with a rather hefty faux leather base with a metal plaque as well as an acrylic case. However, knowing me, I would be the one to take the car off its display... and I gotta say, it’s worth the effort. Getting into the model itself, let’s start with the exterior. The metallic flake of the car is absolutely fantastic. Upon closer inspection, you would realize that the car isn’t just black. But BBR actually went into the painstaking effort to mimic the flakes as close as the actual as possible. There are no excessive glue residue or streaks typically found on a Hotwheels Elite of the late, nor as there any paint imperfections found on a few AutoArts in my collection. The paints and Shutlines are flush, and rightfully so at this price point. Now onto the wheels/brakes. If I HAD to nitpick, this would be a mixed bag for me. The vented ceramic brake-discs on all four wheels are replicated with complete faith. Unlike semi-upscale models, the ceramics on these aren’t complete grey/silver. There’s flakes in the paint to make it look more realistic in comparison. Now my example came with red calipers. I’m not particularly a huge fan of red calipers in general..however, the ones of this would compliment the interior rather well. As for the rims, oooooOOOoo they’re definitely a treat. They’re not just well defined, but the fact that the lugs are painted separately and the detailed Ferrari logo are all present on a wheel that is essentially the size of a fig, is astounding. Now onto that slight nitpick... the unbranded fine-traded tires. Granted that branded tires are somewhat ‘new’ to the scaled model game, I felt like BBR could have taken that extra liberty to so do.. especially on something that’s as extravagant and grand as a BBR Model. Moving onto something I absolutely love about upscale models... carbon fiber works and meshed grills. Who doesn’t like more detail on their cars? There are absolutely no solid grills or the likes on any part of this car. The front grill, three side blades, rear diffusers all features meshed grills. What’s even better, is the fact that the hexagonal shapes on the front grill are all replicated to scale. The F12 tdf has a notable features in that it features a Formula 1 inspired carbon fiber front spoiler, directing air into the engine bay. The sharp blades up front as well as the fin-shaped carbon fiber dive planes are so detailed that they honestly seem a bit too fragile to touch. Nevertheless, being a part of this Diecast, it’s absolutely remarkable to think that BBR somehow managed to not only mimic the shape of the creases, but also allowing for such a thin and detailed structure. Bravo BBR, Bravo. The steering wheel features a host of buttons typically found on modern Ferraris, including the famed Manettino dial, start up button and carbon fiber paddle shifters found in front of the wheel. Oh yeah, there’s more carbon fiber detail to be found on the steering wheel itself as well. Onto the floor pan of the model, it features the typical tread-plate and carbon panel with metal rails you would see on track-focused variants such as the 360 Challenge Stradale and F430 Scuderia. As for the centre console, the carbon fiber weave looks to be a separate layer on top of the dash board, which was seemingly mold into place. As for the stitching, you would expect nothing less from BBR.. fantastic in every sense. One thing that caught my attention was not only the attention to detail, but the fact that every notch and button had writings on top, similar to the real car. Moving onto the passenger side, the lucky occupant is greeted with a speedo/rev-display, in case you’re not too sure how fast the car is actually going. A interesting detail on the tdf is that the glove box is sacrificed in place of simple knee padding with alcantara. Similar to the drivers side, the floor pan on the passengers feature a tread-plate that’s integrated into the single carbon fiber shell of the car. The interior is most definitely where the model stands out amongst the sea of 1:18 Ferraris. As far as I can see, BBR did not take any shortcuts whatsoever to painstakingly replicate every single detail there is... from the different use of materials to mimicking every buttons with complete faith. I mean honestly...just look at the interior yourself.. Remember what I said about the stitchings on this model? Yeah. Just look at the seat itself.. Under the astronomically huge bonnet you would find on the likes of the F12 tdf, F12 Berlinetta, GT4/C Lusso, FF and the likes, you would find a naturally aspirated V12. In the case of the tdf, it’s a tuned up version cranking out 769 horsepowers. In fact, the car was so fast that Jeremy Clarkson himself stated that the car should have LESS horsepower! The engine itself is definitely a treat to any collectors alike. Again, the attention to detail and carbon fiber is fantastic. Everything from the plaque stating who build the engine to the fluid filler caps and warning stickers are all present. However, even with the fantastic detail that came with the HW Elite, it’s not hard to begin to see why the BBR costs 4-5 times more. See below to see the comparison. The hinges are a bit of a hit and miss on this car. If you haven’t caught on from the images above, the giant dogleg which reveals the massive V12 engine are admittedly out of place. Albeit the hinges on the real car at still pretty damn big, I felt like BBR could have replicated that a lot better. Does it stick out like a sore thumb? Yes it does... however, I don’t usually display my models with their bonnets opened so it’s not as bad I guess. I do however, like the hinges on the real hatch. Another addition I didn’t know on this model is that the rear trunk cover is actually operable. For a split second, I thought I had broken something off the car.. however, upon further inspection, I realized that BBR actually added this feature. Similarly, the trunk also features the infamous plaque that comes with every tdf. Now what is this plaque you ask? It’s actually a list of extras and bespoked parts that the said owner requested on their tdf. This plaque would includes the likes of Ferrari Personalization Progamme and/or tailor made elements such as the Tricolore stripe down the centre of the car as well as the any extra carbon fiber parts. At the end of it all, this model is absolutely amazing. The attention to detail will definitely satisfy any true diehard fans. 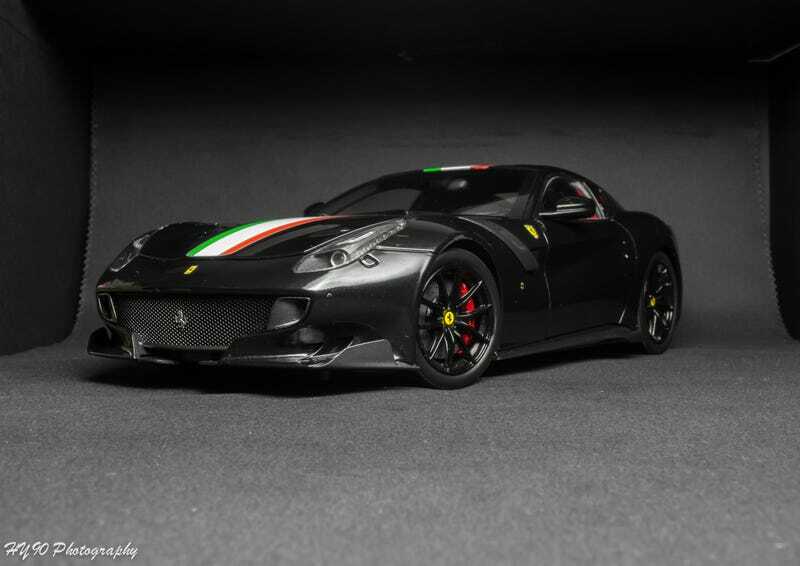 Whether you are a Hotwheels Elite fan looking for a more refined taste, or simply a Ferrari collector and enthusiast alike, this right here is definitely one to take a second gander at. A lot of you out there will complain about the price.. (roughly $400), which is definitely... definitely. a. huge. chunk. of. change. This is one of those niche products where you have to appreciate the art of the scaled model instead of focusing too much on the price. Don’t forget that BBR RESIN models can go upwards of $600+. So do I recommend this model? Most definitely so. Although those are one or two details where I wished BBR would pay a little more attention to, I still believe that this is one of the best models in the 1:18 game. Need I say, a strong contender for Best 1:18 Model of 2018?